Now, I'll admit, I never really understood all the big fuss around Num Noms - I just didn't get it but both my kids are now obsessed so I finally get it. If you're not familiar with Num Noms they are a small collectable toy, aimed at children 3 and over. They are each scented and are a really cute little rubber style toy. Isla is below the target age so has supervision with them but shes the one most obsessed with them. We were sent the Sweets Sampler Lunchbox Deluxe which comes complete with 10 characters in total, one of which is a surprise character and two lip glosses. Obviously the lip glosses are a little too old for Isla, and not really for Jack but Isla loves smelling them and putting them on other people. The Sweet Sampler is priced with an RRP of £16.99, we also received a copy of the new Num Noms magazine which is priced at £3.90. The magazine was a surprise treat they both enjoyed and was perfect for a few minutes peace. They enjoyed seeing the familiar faces within the magazine, although Jacks now at the stage where he let Isla have it 'as its for girls'. The magazine came with a couple of free gifts including a click camera showing Num Noms characters within the lenses and some stickers for the collectable sticker album. 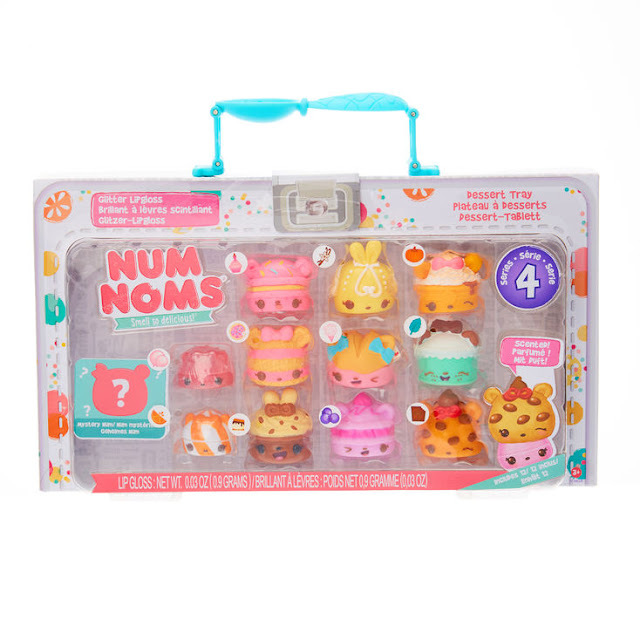 Each of these are perfect for little ones, Num Noms are lovely collectable toys which are different to the usual collectable items going around. They are soft and less likely to break whilst still a decent size. As I've mentioned both kids love them, especially Isla and they are constantly adding to their collection when they go to the shops. Please Note: We received these in exchange for an honest review. All words and opinions are my own and not influenced in any way.